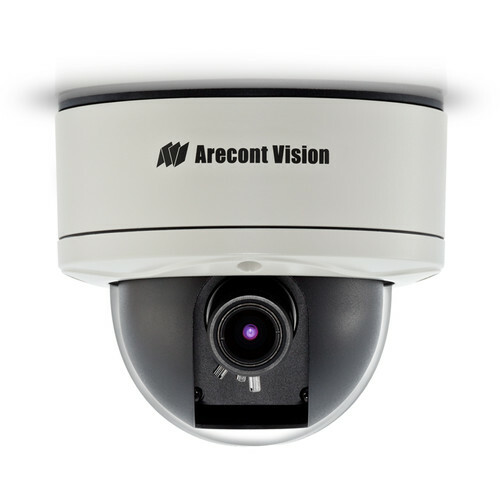 The MegaVideo D4 Series 3MP Outdoor Network Dome Camera from Arecont Vision features a 1/3.2" sensor and 3.3-10.5mm varifocal lens for capturing videos at a maximum resolution of 2048 x 1536 at 21 fps. This day/night camera provides 24-hour surveillance thanks to a removable IR cut filter. Enclosed in an IP66- and IK10-rated housing, the camera can be used for both indoor and outdoor applications. With True WDR (Wide Dynamic Range) up to 100 dB, it allows improved image quality in scenes consisting of both bright and dark areas.